The Iai Hakkyoku-hen is a set of nine mihatsu (iai) kata beginning with the sword sheathed. The character i 居 has the meaning of “to be or to exist”. The character ai 合 has the meaning of “to match or combine”. Hakkyoku 八極 means “in eight (or all) directions according to ancient Chinese thinking”, while hen 変 signifies “change”. Therefore Iai Hakkyoku-hen 居合八極変 means “to be present and adapt to changes in any direction”. In this work phrases like “according to my thinking” appear. These refer to the second head of Katayama-ryū, Katayama Hisataka (1626-1699) the author of the Heisō Jirinden. Within bu there is the art and the way. The art is technique and the way is reason. A man who understands technique but does not understand reason is one who tests his skill with the sword on another person. 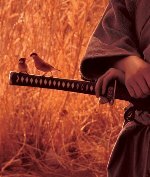 A person who understands reason but not technique is unable to use his sword. A person who posses both technique and reason is one whose blade is finely honed but kept firmly in its scabbard. One who has quality of character in addition to having a well honed blade kept firmly in its scabbard will not be defeated if an enemy appears. The iai of the Hakkyoku-hen is a reorganization of the 18 ancient techniques of iai (koden jūhattō no iai 古伝十八刀の抜刀) into the current hakkyoku form. The Hakkyoku-hen comes out of the Ōhen Hakkyoku with the newly formed mihotsu and ihotsu forming the two sides of this path for the subjugation of violence. The character en 圓 means “round in shape” and ha 波 means “wave”. Therefore Enpa 圓波 means “round waves”. According to my thinking, a circle 圓 is a natural shape containing no corners or boundaries. This means that one must not obstinately fixate on any one particular corner or section of a matter while being ignorant of the whole. Nami (or ha/pa) 波 means to not go against the ebb and flow of the sea. Therefore Enpa means to “exist naturally in a situation and not fight against it”. Enpa places particular importance on kenraitekihō 拳来踢報 (a phrase which literally means “if a fist comes, kick it back”). In the oral teachings the following is said. En is a word liked by many warriors. When the mind is concentrating on something the most naturally suitable way for a warrior is to wait without unease, making one’s outward appearance round. Nami 波 (wave) has the hidden meaning of nami 並 (average or common) and has the meaning of “as usual”. Being intimate with those close to you and distance with those who are not. Being where one should be and leaving a place one should leave. If one’s sword is in its scabbard, one will not be feared or doubted by others. Keeping the way of the heavens hidden inside one’s spirit and conducting oneself in the same manner as the rest of society is the usual way of conduct for Enpa. If there is someone who is trying to destroy the way of the heavens, destroy that person. If there is one who raises their fist, it matters not at all if you kick him back. It is important in swordsmanship to adapt to one who is trying to instigate. Enpa is used as a technique to strike back. The character ai 相 means “mutually” and the character ai 合 means “to come together”. Therefore Aiai 相合 has the meaning of “mutually coming together”. According to my thinking, ai 相 has the meaning of oneself and another individual facing off against each other. Ai 合 has the meaning of making harmony between one’s own path and that of another. When you cannot attain victory, nor can your opponent attain victory you mutually return to a state of harmony, this is called making the best of a situation. This is important for Aiai 相合. In the oral teachings the following is said. Gaining victory over a person and receiving hatred is not acting in accordance to the way of the heavens. In the technique of Enpa also one cannot harmonize well with a person who is not suitable. A person who acts upon the will of the heavens (that is to say, does not live according to their own selfish desires) is one who does not exceed his own social status or ability. Because of this, even if they are affluent, they will not give in to extravagance. A result, even the poor will not resent such a person. Resentment and hatred are incited by oneself at one’s own invitation. One who knows this seeks the way of gattai-ikka 合体一和 (making a peaceful world together with others). If one has surplus after one’s own use, it should be donate to others to help those in need. This is gattai-ikka. One who acts believing that this is true bu is carrying out shinbu 神武 (literally “divine martial arts”). This is the bringing up of others in the same way that not killing others is the way of the heavens. The character hi 飛 means “to fly or jump” while the character ran 乱 means “chaos or to subdue”. Therefore the meaning of Hiran 飛乱 is “to subdue like a bird in flight”. I believe that hi 飛 is the hi in hichō 飛鳥 (flying bird). Clear things are light and rise upwards. Ran is to subdue or govern. A bird in flight is kyochūmuga 虚中無我 (selfless and devoid of thought) and soars in the air freely, not mistaking it’s path. If one cannot accomplish something now, do it at a different time, if one cannot accomplish something here, do it elsewhere. Even if an assignment is not made because the timing is inappropriate, this does not mean the assignment will never be made. Meeting with friends of the same mind and discussing matters is to make use of Hiran. In the oral teachings the following is said. When the timing is not appropriate, one abides by the current timing and remains still. One must not act recklessly. This would be throwing away the way of living one should follow. The timing for taking action on things is poor. The character ran 乱 means “to lapse into chaos” and the character ha (or pa) 波 means wave. Therefore Ranpa 乱波 means “big wave”. According to my thinking, Ranpa is large waves. A bujin 武人 (literally “military man”) wins without fighting. A boatman crosses the sea without swimming. The boatman does not swim because he is riding the boat. A bujin does not fight because he is making use of bu. Even if the bujin is given some assignment, he does not disturb his surroundings (while carrying it out). When a boatman encounters a large wave, he does not force things, but rather rides the waves as if there were no waves at all. He can do this because is aware of all the conditions at all times. Understanding timing is important in Ranpa. In the oral teachings the following is said. Ranpa‘s importance on understanding timing is like the normal appearance of a farmer or merchant. One does not make known one’s understanding of the arts of the warrior. A boatman does not sail on rough seas. Rather he crosses after having thoroughly examined the state of the winds. This is because the boatman understands the danger of large waves better than normal people. He does not sail when the wind and waves are strong. The character ko 虎 means “tiger” and the character sō 掻 means “to scratch or claw”. 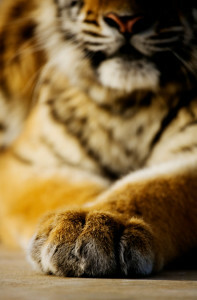 Therefore Kosō 虎掻 means “the clawing tiger”. According to my thinking, besides bun 文 (learning and knowledge), the tiger is the beast that is kept within in bu 武. Sō 掻 is the sharpening of the nails for the purpose of clawing. The tiger, of which there is no stronger beast, is always precisely sharpening its claws. It is always making such preparations. By the adjustment of a small point of one sun (approx. three centimeters), something large as six shaku (approx. 180 centimeters) is completed. This is what is important in Kosō. In the oral teachings the following is said. Being exceedingly conscious of the finest of details is of importance in Kosō. One must not believe it is fine to simply mimic the customs of society to a certain degree and then secretly take pleasure in the fact that there is no one who finds fault with you. If one is pained by just the nail on one’s little toe, one cannot walk and will be unable to do that day’s work. One does not capriciously enter a duel against one with supreme technique. Be diligent against carelessness. The character ura 浦 means “coast or inlet” and the character nami 波 means “wave”. Therefore Ura-no-nami 浦波 has the meaning of “waves on the coast”. According to my thinking, ura 浦 is a cliff on the seashore. The waves advance in accordance to the ebb and flow of the sea, but high waves crash upon a cliff with no thought of measuring its height and additionally leave water in crevices on the top of the cliff. This water cannot return to the sea and becomes stagnant. If a bujin does not act in accordance with the rest of society in the end he will be deserted by it. Knowing oneself, knowing others and acting in accordance with the norms of the world is the important point of Ura-no-nami. In the oral teachings this is said. If one does not understand one’s own ability and goes too far being lofty and grandiose while trying to follow the way of the heavens, one will be scorned by society and end up a person separated from it. One cannot guide others in this way. One must treat hard things softly and difficult things tenderly like the raising of an infant. One who says only lofty things is one who has not mastered oneself. If one tries to demonstrate things to the people of the world which one has not mastered oneself, they will not be believed by anyone. A master skillfully does things according to the situation to an appropriate degree. The character saka 逆 means “to oppose or go against”, while the the character nami 波 “wave” is a substitute for the character nami 並 “usual or ordinary” and has the meaning of “the customs of society”. Therefore Sakanami 逆波 has the meaning of “to go against the customs of society”. According to my thinking, saka 逆 is to go against. It means to observe customs of the world that should not be followed and not abide by them. There is reason behind doing this. A bujin does not set sail on the seas when the order of one’s country has lapsed into chaos, nor does he retreat to live in the mountains away from the world when the government in one’s country is about to collapse. One maintains a proper spirit and repels wickedness and hides the proper reasoning of things within oneself while feigning foolishness. This is of importance in Sakanami. The following is said in the oral teachings. If one tries to continue in the way of living that is Enpa’s “to conduct oneself in the same manner as the rest of the world”, the way of keeping the sword in its scabbard is there, but if the sword has been draw, no matter how much of a master one is, there is no way to handle the matter (by Enpa alone). The character saka 逆 means “incorrect or to oppose”, omo 面 means “face” and taka 鷹means “hawk”. Sakaomodaka means “a hawk with its neck lowered”. According to my thinking, saka 逆 is to have the head lowered and tail raised, moving downward from above. Omo 面 is the neck or head. 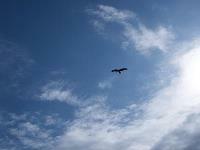 Taka 鷹 is the usual state of an ascending bird facing towards the sun. Because it does this in an emergency it can dive from above with force. If not, it would be unable to carry out the aim it has as an associate of the sun. This is like employing a doctor who, unaware that a fatal disease is untreatable, exhausts all his secrets and keeps administering medicine, while never seeking the advice of his colleagues. Therefore the main point of Sakaomodaka is to have people to become colleagues with. It is said in the oral teachings that the main point of Sakaomodaka is that there are things to become associated with which is similar to how one must not oppose nature. It is even more so with people. As a rule, doing things that are difficult first and leaving the things you are good at until later is the smoothest way to handle affairs. The reason a hawk descends when attacking various birds is because it is good at ascending. There with always be various inadequacies when doing a task that is someone else’s and the true state of things will be unclear. The result will often be a great deal of negligence and the receiving of shame. The character uku 浮 means “to float on water” and fune 舟 means “a small boat”. 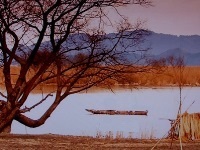 Therefore Ukifune 浮舟 means “a small boat floating on the water”. I feel that this has the meaning of an empty boat naturally floating in the center of a river. If one does not have yo 陽 (yang or the bright, positive and proactive) built up in one’s heart, one should procure opportunities, like piling them into an empty boat. The following is said in the oral teachings. Something that is originally void will absolutely become real when one makes use of it. This is because when something that is usually empty becomes needed it receives yo/yang. This is exactly like an empty boat which, when it becomes necessary is loaded with baggage and goes about its task, floating on the water. A doctor does not go out because he goes to the homes of the sick. This is because he can go to those who cannot go out. The bujin who keeps himself empty internally can make that emptiness take form when the necessity arises. Something that already has taken shape cannot take shape further, while an internal emptiness can take form easily. There may be many misconceptions in that which is without form, but that which has already taken form cannot adapt to changes that arise. That is it cannot be put to use at that moment. I believe this is discarding all of one’s selfish and wicked feelings and acting on one’s natural true spirit. If there is one who acts in complete accordance with their true nature, it is said that the way of the heavens will take notice of and protect such an individual. In the oral teachings the following is said. If one uses the technique of Enpa and adheres to the spirit of Ukifune, even Seigan or Konyu will be of no use in the event of an encounter. If one is constantly like this they will bring no shame to their country, regardless of where they travel. However from time to time one may encounter some unforeseen situation and in such times it is not unusual to slip, this is because one does not fully comprehend this teaching and, furthermore, is caught off guard. If one can maintain their spirit as usual and not become disconcerted when they meet the unexpected, it is good. Such people can do this because they are prepared and have realized that change is always this sort of thing. However this is something one is liable to be careless about in everyday life. This is the cause of not making Ukifune the core of one’s spirit. Even if we say terms like the Ohen Hakkyoku, Iai Hakkyoku-hen, ihotsu or mihotsu, in reality these things are all the same and there is nothing else. This is something which can be clearly understood when viewing the diagram.